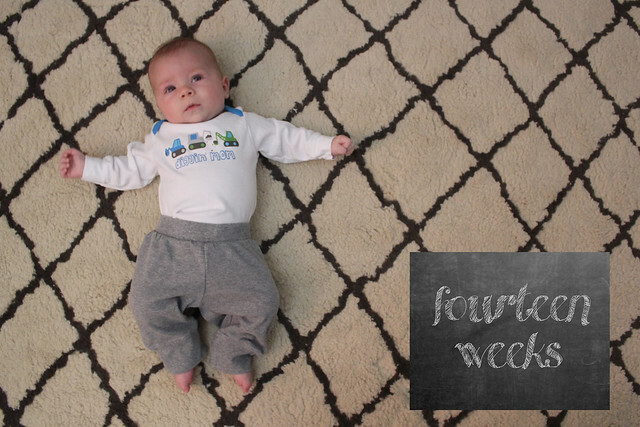 Little man is fourteen weeks old! which was going to happen whether he liked it or not! He had a couple forced feedings, but overall he rolled with the punches. He sure doesn’t look like he’s missing any meals. When looking back at Kenley’s updates, this was the week we had quit the swaddle. I don’t think that’s going to be happening any time soon with Crosby. and has been getting out of his SleepSack . We’re now trying the SwaddleMe . to put his paci back in his mouth or console him back to sleep. Considering how well he’s been sleeping up until this point, we’re perfectly fine with that! It’s crazy how much he’s changing week to week. I love him! He’s looking so different with each passing week–I see some Kenley in that little face! He is precious! Makes me want to hold him and snuggle with him! Has he grown into the outfit that I sent with your Mom and Dad yet? Can’t wait to see him in it! Thank you Diane! I just washed it this week, so I am hoping to get it on him soon. It’s so cute, I can’t wait to see it on him. I’ll definitely post pictures!